Task: Move two matchsticks to make ten triangles. Matchstick Puzzles Level 60 Walkthrough, Cheats, Solution for Android, iPhone, iPad, iPod. 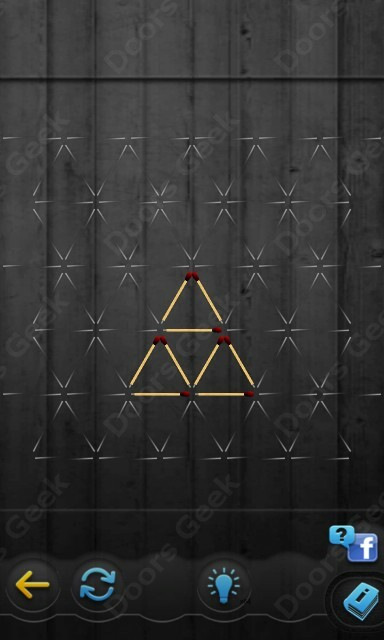 Note: This is "Matchstick Puzzles" by "TACOTY play"
Task: Remove six matchsticks to make six equal triangles. Matchstick Puzzles Level 59 Walkthrough, Cheats, Solution for Android, iPhone, iPad, iPod. Task: Move four matchsticks to make six diamonds. 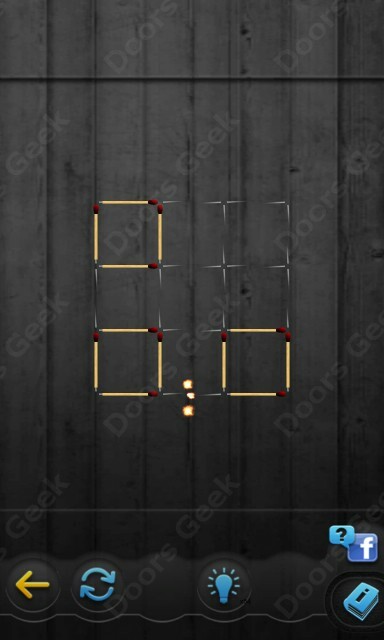 Matchstick Puzzles Level 58 Walkthrough, Cheats, Solution for Android, iPhone, iPad, iPod. Task: Move five matchsticks to make three small triangles and three big triangles. 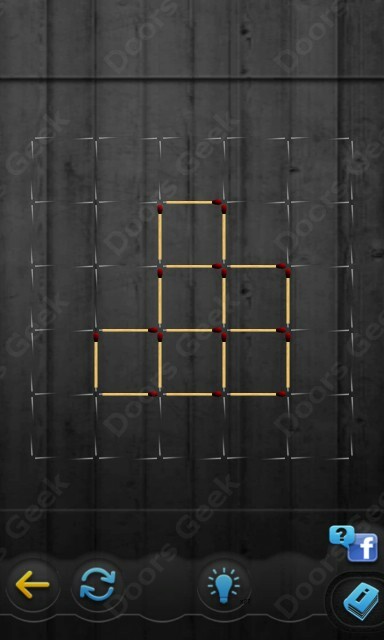 Matchstick Puzzles Level 57 Walkthrough, Cheats, Solution for Android, iPhone, iPad, iPod. Task: Move four matchsticks to make six equal triangles. 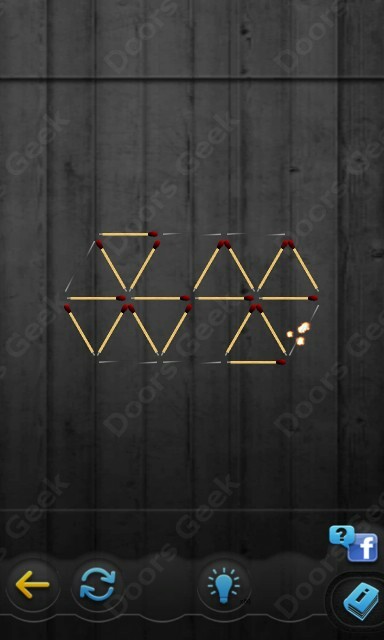 Matchstick Puzzles Level 56 Walkthrough, Cheats, Solution for Android, iPhone, iPad, iPod. Task: Move three matchsticks to make five equal triangles. Matchstick Puzzles Level 55 Walkthrough, Cheats, Solution for Android, iPhone, iPad, iPod. Task: Move six matchsticks to make five squares. Matchstick Puzzles Level 54 Walkthrough, Cheats, Solution for Android, iPhone, iPad, iPod. Task: Move three matchsticks to make six equal squares. 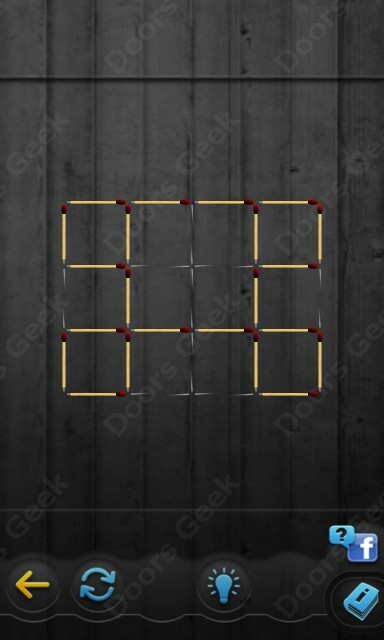 Matchstick Puzzles Level 53 Walkthrough, Cheats, Solution for Android, iPhone, iPad, iPod. Task: Move six matchsticks to make two squares. 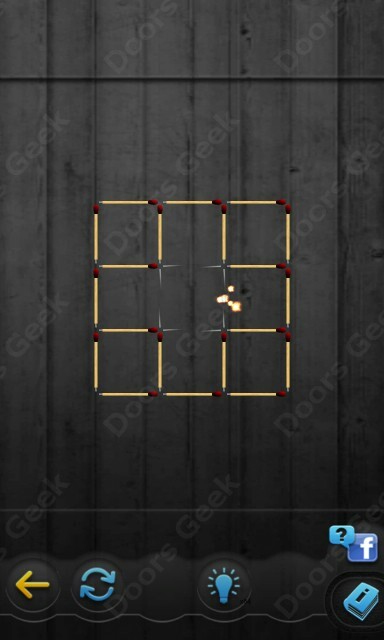 Matchstick Puzzles Level 52 Walkthrough, Cheats, Solution for Android, iPhone, iPad, iPod. Task: Move four matchsticks to make one big diamond and two big triangles. 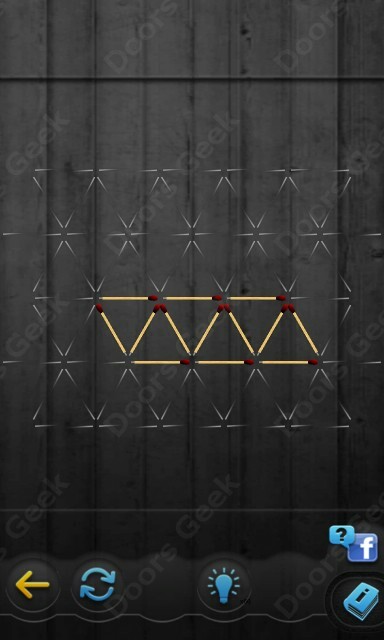 Matchstick Puzzles Level 51 Walkthrough, Cheats, Solution for Android, iPhone, iPad, iPod. Matchstick Puzzles Level 50 Walkthrough, Cheats, Solution for Android, iPhone, iPad, iPod. Task: Move four matchsticks to make six triangles with one diamond shape. Matchstick Puzzles Level 49 Walkthrough, Cheats, Solution for Android, iPhone, iPad, iPod. Task: Move four matchsticks to make three triangles. 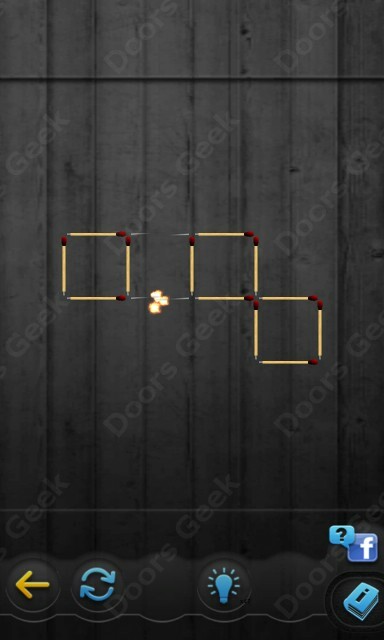 Matchstick Puzzles Level 48 Walkthrough, Cheats, Solution for Android, iPhone, iPad, iPod. Task: Remove three matchsticks to make three same rectangles. 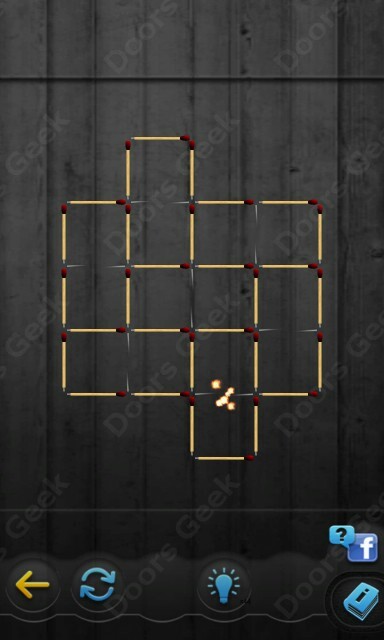 Matchstick Puzzles Level 47 Walkthrough, Cheats, Solution for Android, iPhone, iPad, iPod. Task: Move four matchsticks to make nine squares. 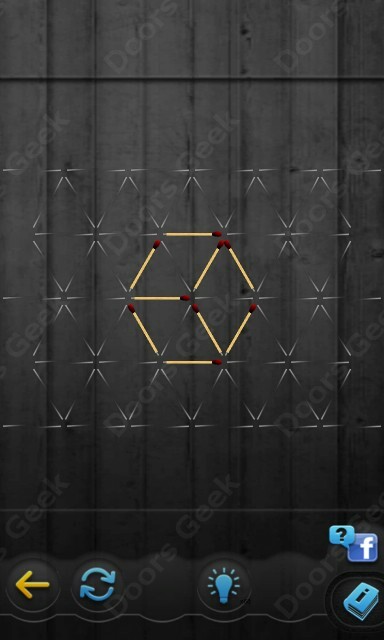 Matchstick Puzzles Level 46 Walkthrough, Cheats, Solution for Android, iPhone, iPad, iPod. Task: Move four matchsticks to make one big diamond and five small triangles. Matchstick Puzzles Level 45 Walkthrough, Cheats, Solution for Android, iPhone, iPad, iPod. Task: Remove four matchsticks to make three squares. 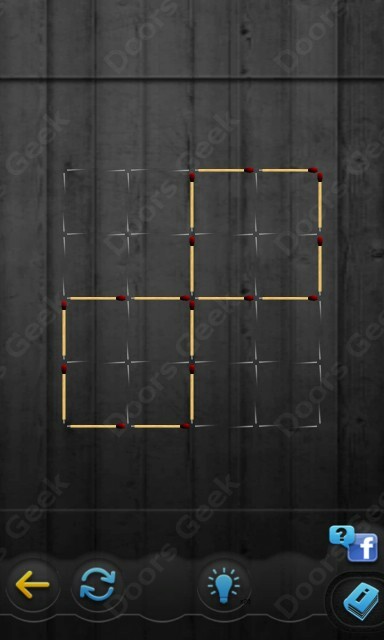 Matchstick Puzzles Level 44 Walkthrough, Cheats, Solution for Android, iPhone, iPad, iPod. Task: Remove three matchsticks to make four equal squares. Matchstick Puzzles Level 43 Walkthrough, Cheats, Solution for Android, iPhone, iPad, iPod. Matchstick Puzzles Level 42 Walkthrough, Cheats, Solution for Android, iPhone, iPad, iPod. Task: Remove five matchsticks to make five squares. 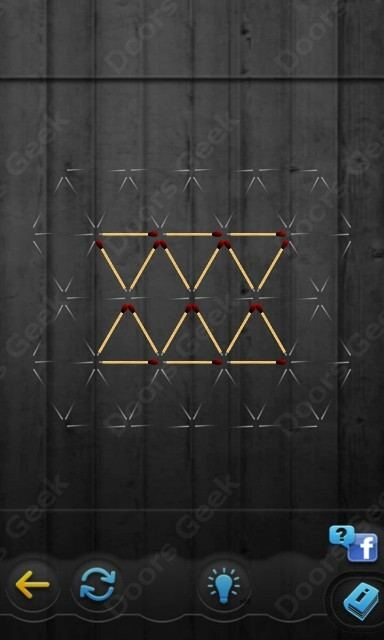 Matchstick Puzzles Level 41 Walkthrough, Cheats, Solution for Android, iPhone, iPad, iPod. Task: Remove seven matchsticks to make seven equal rectangles. Matchstick Puzzles Level 40 Walkthrough, Cheats, Solution for Android, iPhone, iPad, iPod. Task: Move three matchsticks to make four equal squares. Matchstick Puzzles Level 39 Walkthrough, Cheats, Solution for Android, iPhone, iPad, iPod. Task: Remove two matchsticks to make three equal squares. Matchstick Puzzles Level 38 Walkthrough, Cheats, Solution for Android, iPhone, iPad, iPod. Task: Move three matchsticks to make three separate non connected squares. 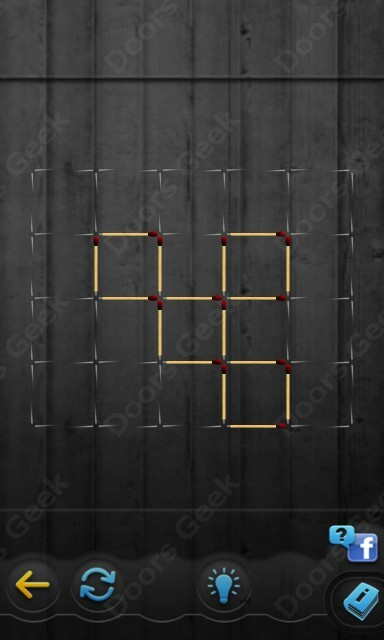 Matchstick Puzzles Level 37 Walkthrough, Cheats, Solution for Android, iPhone, iPad, iPod. Task: Move six matchsticks to make six equal squares. 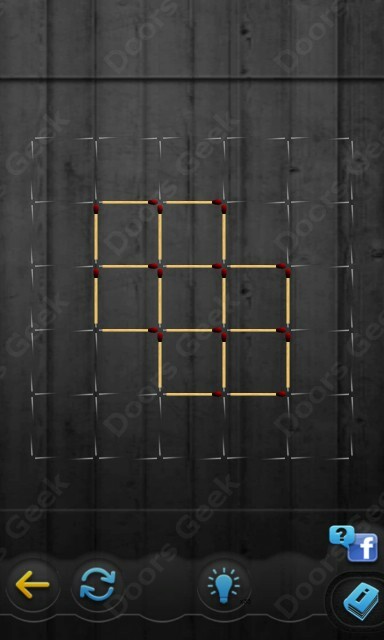 Matchstick Puzzles Level 36 Walkthrough, Cheats, Solution for Android, iPhone, iPad, iPod. Task: Move three matchsticks to make ten squares to connect the two shapes. Matchstick Puzzles Level 35 Walkthrough, Cheats, Solution for Android, iPhone, iPad, iPod. Task: Move four matchsticks to make five squares. Matchstick Puzzles Level 34 Walkthrough, Cheats, Solution for Android, iPhone, iPad, iPod. Task: Move four matchsticks to make six squares. 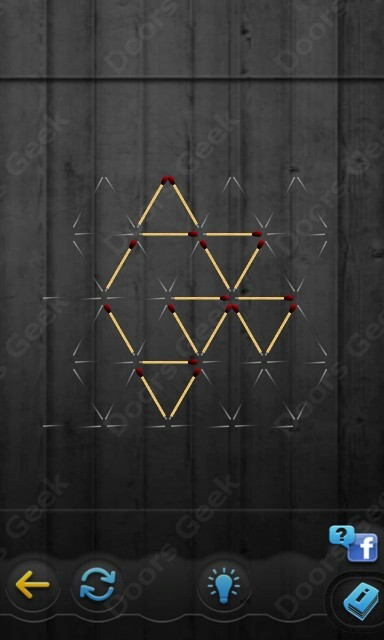 Matchstick Puzzles Level 33 Walkthrough, Cheats, Solution for Android, iPhone, iPad, iPod. Task: Remove six matchsticks to make three seperate non connected squares. 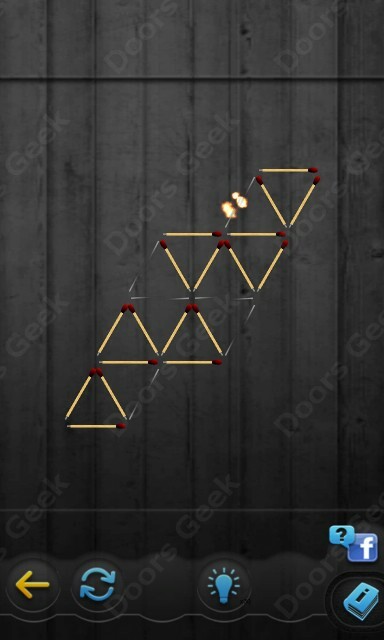 Matchstick Puzzles Level 32 Walkthrough, Cheats, Solution for Android, iPhone, iPad, iPod. Task: Move three matchsticks to turn the fish to the opposite direction. Matchstick Puzzles Level 31 Walkthrough, Cheats, Solution for Android, iPhone, iPad, iPod. Task: Move four matchsticks to make one large triangle and two small triangles. Matchstick Puzzles Level 30 Walkthrough, Cheats, Solution for Android, iPhone, iPad, iPod. Task: Move two matchsticks to make one rhombus and one triangle. Matchstick Puzzles Level 29 Walkthrough, Cheats, Solution for Android, iPhone, iPad, iPod. Task: Move four matchsticks to create four identical rhombuses. 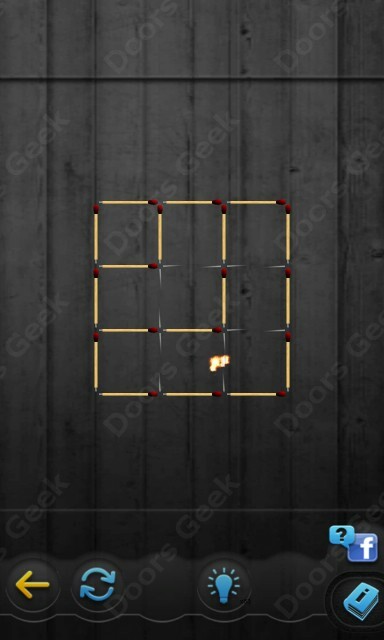 Matchstick Puzzles Level 28 Walkthrough, Cheats, Solution for Android, iPhone, iPad, iPod. Task: Move four matchsticks to make four triangles of the same size. Matchstick Puzzles Level 27 Walkthrough, Cheats, Solution for Android, iPhone, iPad, iPod. Task: Remove four matchsticks to leave four triangles of the same size. 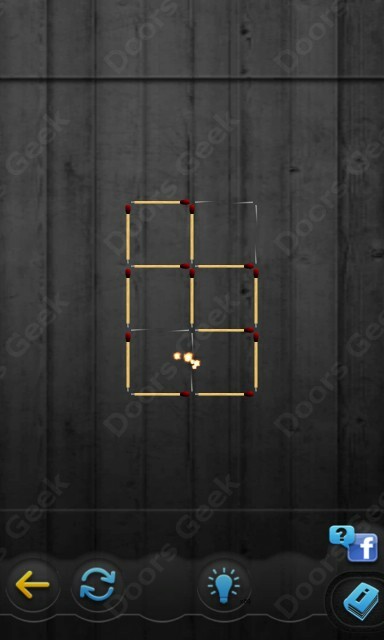 Matchstick Puzzles Level 26 Walkthrough, Cheats, Solution for Android, iPhone, iPad, iPod. Task: Move two matchsticks to make six triangles. Matchstick Puzzles Level 25 Walkthrough, Cheats, Solution for Android, iPhone, iPad, iPod. Task: Remove three matchsticks to leave three triangles. 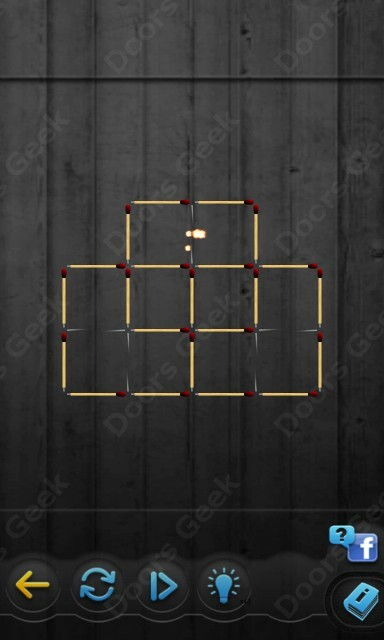 Matchstick Puzzles Level 24 Walkthrough, Cheats, Solution for Android, iPhone, iPad, iPod. Task: Move three matchsticks to form three diamond shapes. Matchstick Puzzles Level 23 Walkthrough, Cheats, Solution for Android, iPhone, iPad, iPod. Task: Move two matchsticks to make two triangles. 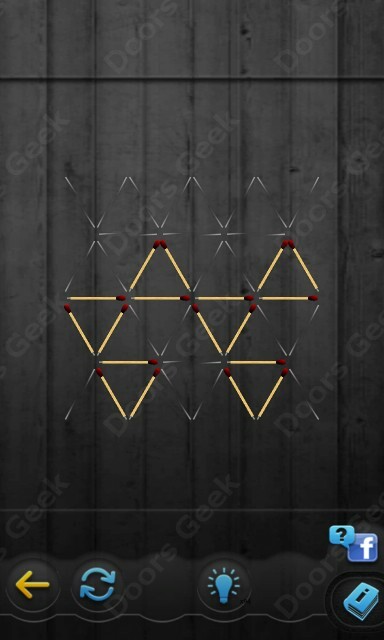 Matchstick Puzzles Level 22 Walkthrough, Cheats, Solution for Android, iPhone, iPad, iPod. Task: Move eight matchsticks to make nine squares. 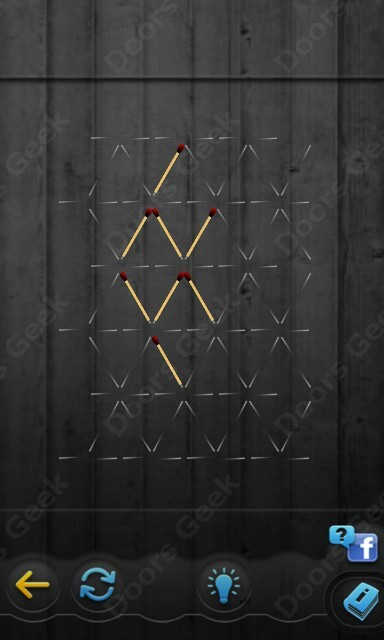 Matchstick Puzzles Level 21 Walkthrough, Cheats, Solution for Android, iPhone, iPad, iPod. Task: Move eight matchsticks to make six squares. 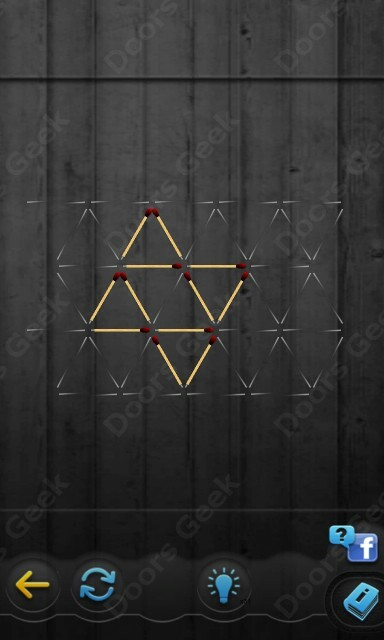 Matchstick Puzzles Level 20 Walkthrough, Cheats, Solution for Android, iPhone, iPad, iPod. Task: Move four matchsticks to make three squares. Matchstick Puzzles Level 19 Walkthrough, Cheats, Solution for Android, iPhone, iPad, iPod. Task: Move three matchsticks to make three squares. Matchstick Puzzles Level 18 Walkthrough, Cheats, Solution for Android, iPhone, iPad, iPod. Task: Remove six matchsticks (but not any of the 12 making the outside border of this pattern) to leave three squares. Matchstick Puzzles Level 17 Walkthrough, Cheats, Solution for Android, iPhone, iPad, iPod. 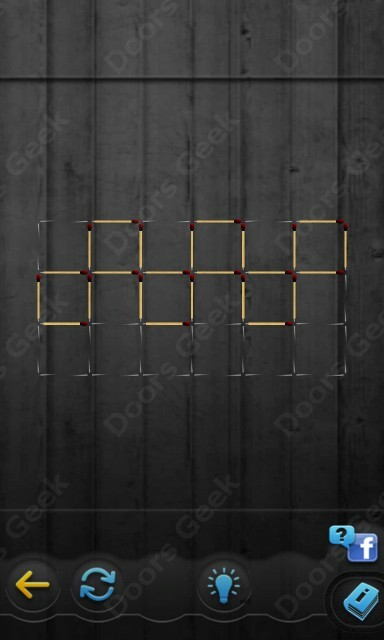 Task: Remove four matchsticks (but not any of the 12 making the outside border of this pattern) to leave five squares. 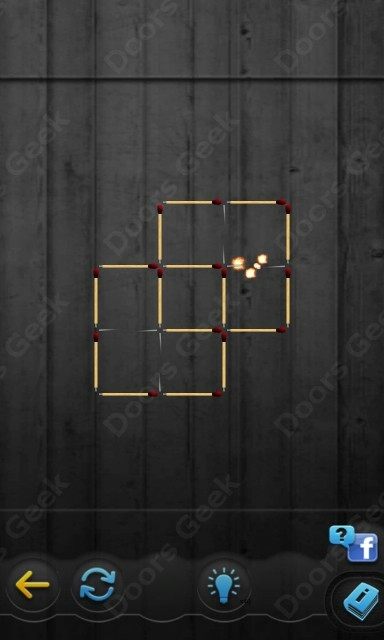 Matchstick Puzzles Level 16 Walkthrough, Cheats, Solution for Android, iPhone, iPad, iPod. Task: Move three matchsticks to make six squares. 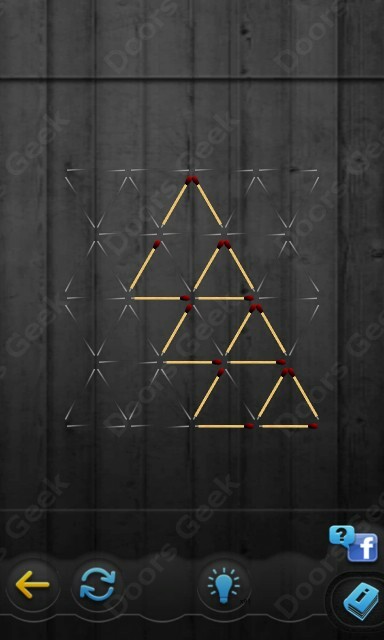 Matchstick Puzzles Level 15 Walkthrough, Cheats, Solution for Android, iPhone, iPad, iPod. Task: Move three matchsticks to make four squares. Matchstick Puzzles Level 14 Walkthrough, Cheats, Solution for Android, iPhone, iPad, iPod. Task: Move two matchsticks to make five squares of the same size. Matchstick Puzzles Level 13 Walkthrough, Cheats, Solution for Android, iPhone, iPad, iPod. Task: Move two matchsticks to make two squares. Matchstick Puzzles Level 12 Walkthrough, Cheats, Solution for Android, iPhone, iPad, iPod. Task: Remove two matchsticks to make three squares. Matchstick Puzzles Level 11 Walkthrough, Cheats, Solution for Android, iPhone, iPad, iPod.